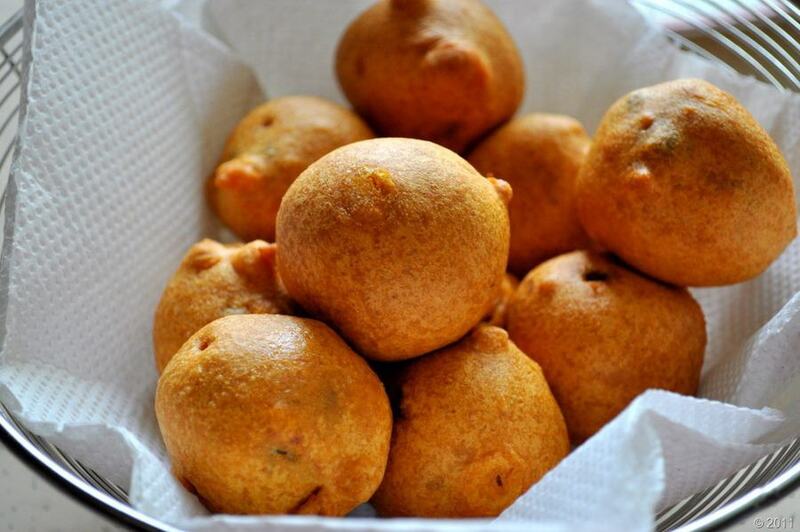 Potato Bonda is a typical south indian snack and is very famous in hotels.If we order parcel they will pack it in a banana leaf with coconut chutney(கெட்டி சட்னி).No words to describe the taste. What do you keep on hand to serve for an unexpected guest? If you have this mix in hand,you can make any kind of bonda and baji.Even you can make pakoda also.Just mix the flour with water,slice onion/potato/raw banana.You will get hot bajis or you can make onion pakoda,cashew pakoda,etc…Lets see the recipe for the mix. In a mixing bowl add besan flour,rice flour,chilli powder,turmeric powder,salt and cooking soda. Sieve the flour and make sure that it should be without lumps. 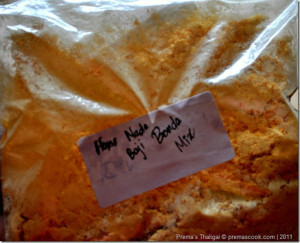 Here is the Baji | Bonda Mix is ready.Lets see the recipe for Potato Bonda using this mix. Take the Bonda mix in a mixing bowl,add water and mix it. The batter should not be too thick or thin,it should be like dosa batter consistence.Keep aside for 15 minutes. Meanwhile Boil the potatoes till soft. Once it got boiled smash it. Heat oil in a pan,add the Mustard seeds and hing. Once the mustard seeds splutter,add the ginger,onion,peas and green chillies into it.Add the Turmeric powder,salt and potatoes into it.Cook it till the potatoes and peas get cook well.Let it cool for sometime.Heat the oil in low flame. Make the potato mixture into small lemon sized balls. Insert a bamboo skewers into a ball and take the ball carefully. Dip the ball in the prepared bonda mix and take it using the same skewer. This step is for the perfect shape,if you don’t like use your hand. Drop the ball carefully into the hot oil.Turn the other side and deep fry the balls in oil,till golden brown.Repeat the same with the remaining balls. Drain the oil and take the bonda out from the oil. Serve the hot bonda with coconut chutney. 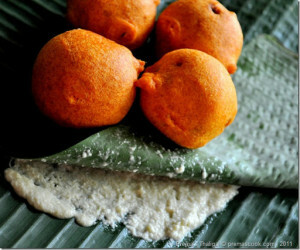 Try this tempting bonda and enjoy the day!!! Ohhhhh…Bondas are toooooooo tempting…Nice idea of making the baji mix…will be very handy. my fav potato bondas,, with getti chutney..
oh God!! it looks so perfect!! i love them!! I’m drooling here. First picture perfect with authentic serving(Parcel :-))of South. Love them absolutely. Looks fantastic. I’m mouthwatering here 🙂 Love to try this soon. mindblowing prema…superb post…i love bonda that too saravana bhavans bonda…surely will try it….and using stick is super idea! Irresistible bondas, makes me hungry, love the way u prepared them.. Awesome demo of a fine luking Potato Bonda.Luv to grab it really. 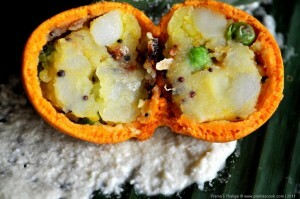 Ohhhhh…Bondas are toooooooo tempting…awesome clicks too.. Perfect bondas..they are so tempting and irresistible. OMG!!!!!! So professional Prema!! My mouth is watering!!! OMG those potato bondas are absolutely gorgeous. Thanks for sharing the home made bhajji mix recipe. Perfect snack for the evening. These bonda’s are mouth watering. I really didn’t know they were famous in the south too, ofcourse the north indian version is a bit different. Wow!it looks perfect and tempting. கெட்டி சட்னியுடன் இந்த போண்டாவை சாப்பிட நாவூறுது,சூப்பர்ர் பிரேமா!! Do drop by my space too .. I love coming across wonderful international recipes like this. The bonda does look like something that I need to try. I will keep an eye out for the ingredients. Great post! Its really mouthwatering and always love aloo bondas a lot. Perfect tempting bondas….Very nicely done and presented dear..
perfect bondas, makes a wonderful snack especially on the cloudy or rainy days.. I like making my own batter too,bondas look absolutely delicious. Beautiful shape and so tempting! 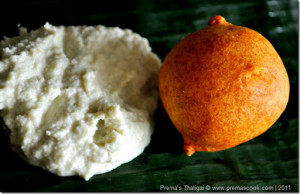 Prema, U made me Nostalgic.. We used to munch this from Collage Canteen .. Those were the days..! Thank you 4 the recipe.. Now u know why I shared those awards with u.. For being an inspiration ,my friend..
wonderful looking, drool over with potatoes inside. Oh no, this look super tempting! especially the last photo. I must try this one day. Thanks for the step by step photo. Oh no, this look so tempting! especially the last photo, i must try this one day. Thanks for sharing the step by steph photos. Bonda with thenga chutney can be very inviting. i would like to invite myself over to your place. 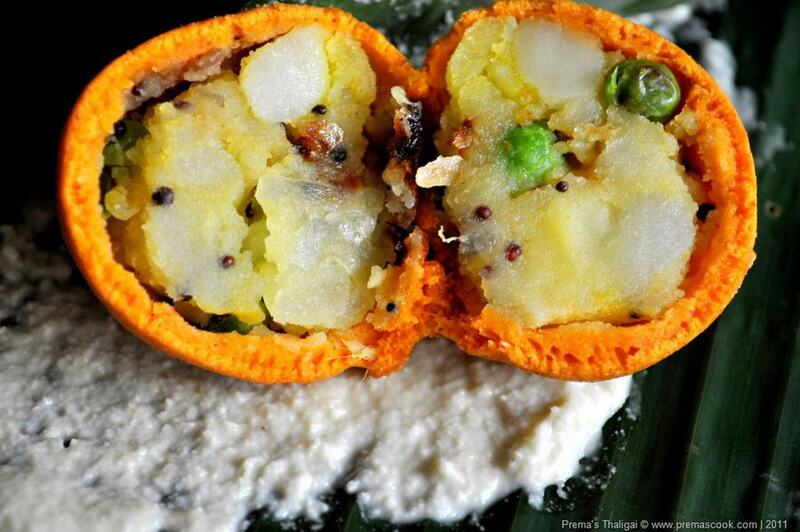 Wow perfect looking boondas…..I am feeling hungry looking at these. Wow! So good and appetizing! I could gobble them one by one! This is so yumm! Just can resist it. Sorry that i missed this post prema, looks so perfect! my oh my…the last picture is torturing me…perfect bonda..love it. I love aloo bhonda!!! I’ve always been scared to try b/c of the dipping. Love your method of using a bamboo skewar. Yours look so perfect… Now I will definitely give these a try! Just mades ’em for a snack to go with tea for mum and i. We loves it. Mum was so impressed that she has asked me to make ’em again but when Dad is around.Yum! Thank you for sharing!